TOKYO, Japan (CNN) -- Even before one reaches the front door of Canon's headquarters in Tokyo, one can sense the virtual stampede of employees pouring out of the building exactly at 5:30 p.m.
Japan's birth rate of 1.34 is below the level needed to maintain the country's population. In a country where 12-hour workdays are common, the electronics giant has taken to letting its employees leave early twice a week for a rather unusual reason: to encourage them to have more babies. 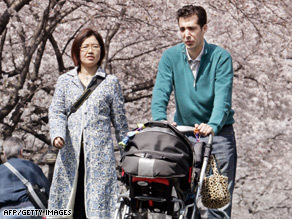 At 1.34, the birthrate is well below the 2.0 needed to maintain Japan's population, according to the country's Ministry of Health, Labor and Welfare. One reason for the low birth rate is the 12-hour workday. But there are several other factors compounding the problem -- among them, the high cost of living, and social rigidity toward women and parenting. In addition, Japan's population is aging at a faster pace than any other country in the world. Analysts say the world's second-largest economy faces its greatest threat from its own social problems, rather than outside forces. And the country desperately needs to make some fixes to its current social and work structures, sociologists say. The 5:30 p.m. lights-out program is one simple step toward helping address the population problem. It also has an added benefit: Amid the global economic downturn the company can slash overtime across the board twice a week. "It's great that we can go home early and not feel ashamed," said employee Miwa Iwasaki.